Achieve the standard. Get TL 9000 Certification today. TL 9000 was created by QUEST Forum to meet the quality requirements of the worldwide telecommunications industry. TL 9000 defines quality management system requirements for the design, development, production, delivery, installation and maintenance of telecom products and services while also providing a measurement system that allows companies to track performance and improve results. With its telecommunications focus, TL 9000 Certification eliminates the need for multiple telecom quality management standards, reduces costs of doing business and ultimately results in better products and services to consumers. What’s more, it provides the consistent set of quality expectations needed to drive efficiency and performance across the global telecommunications supply chain. Requirements to address communications between telecom service providers and suppliers. Get TL 9000 Certification today. Registration to TL 9000 has proven beneficial to both service providers and suppliers. Testimonials and case studies from member companies cite improvements such as a 20% savings in cost of quality; a 40% improvement in on-time deliveries; an 80% reduction in procurement cycle time and 25% reduction in first-year return rates. TL 9000 certification, along with independent audits, allows companies to save time and money by complying with only one quality standard. Customers save the cost of on-site inspections. TL 9000 R5.0 certified organizations have access to performance data for benchmarking that can help them achieve further product and service improvement. This shows a commitment to quality and business excellence. Certification decreases costs of product life cycle management, audits, supplier management expenses and general operations. TL 9000 Certification results in improvements to performance (manufacturing and service), productivity, reliability of processes and production, life-cycle management, supply chain efficiencies, employee teamwork, efficiency of external audits and site visits, operational consistency and quantifies performance results. Provides access to a greater customer base. Enhances the competitive position of certified organizations. Improves customer service and overall satisfaction. Establishes a method to gather and measure quality and performance data. Demonstrates a commitment to product quality and customer value (focus on cycle-time reductions; on-time deliveries; return rates; reliability; defect elimination). Demonstrates the company’s accountability and focus on continuous improvement. Enables the development of stronger customer/supplier relationships. The TL 9000 Requirements Handbook establishes and details hardware, software and services quality system requirements and provides a consistent set of parameters specific to the global telecom industry. Discover how TL 9000 can enhance your business, and the best way for you to obtain this highly regarded certification. Obtaining TL 9000 Certification gives your companies’ management system recognition around the world. QSR is here to streamline certification. Achieve the standard. 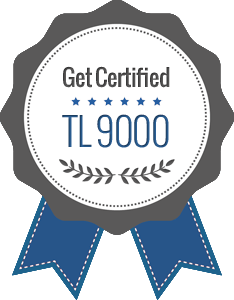 Get TL9000 Certification today.